My stove gets a workout. Between cooking from scratch and canning and preserving, there are plenty of spills, drips and stains. I wipe up the main surfaces daily, often multiple times per day, but the drip pans and the grates over the burners are usually too hot to clean until later – when I'm on to another task. In the over, things do run over occasionally, so that must be dealt with as well. 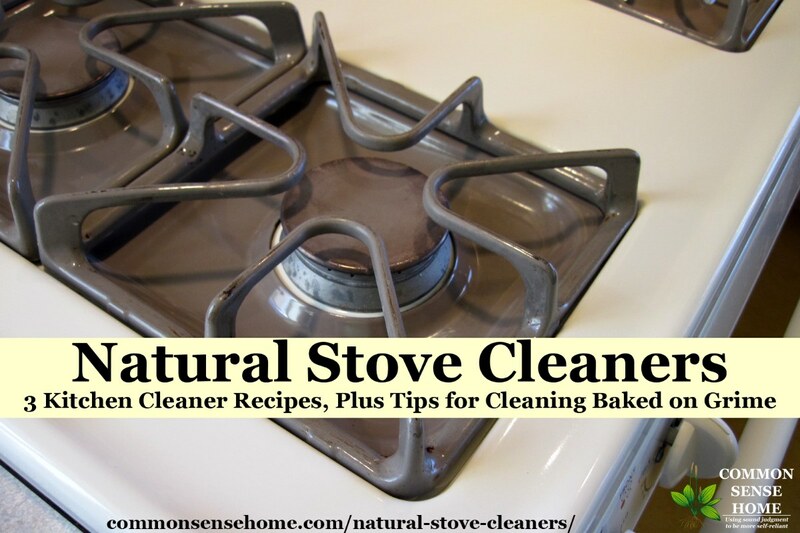 When I went searching for “natural stove cleaners” and “natural stove top cleaners”, I came up with images of stoves with just minor baked on smudges and smears. I figured I can't be the only one out there with a really grimy stove looking for a non-toxic option, so I decided to share what works for me. You can see which wheels get the most use by the relative grime levels. 🙂 The cleanest one one the rear right is a baby burner that doesn't get used much. I prefer to start cleaning in the evening after supper is finished, and let parts soak overnight before scrubbing first thing in the morning to complete cleaning. If your stove isn't this dirty, you can skip soaking and just use the natural stove cleaner options and some elbow grease. 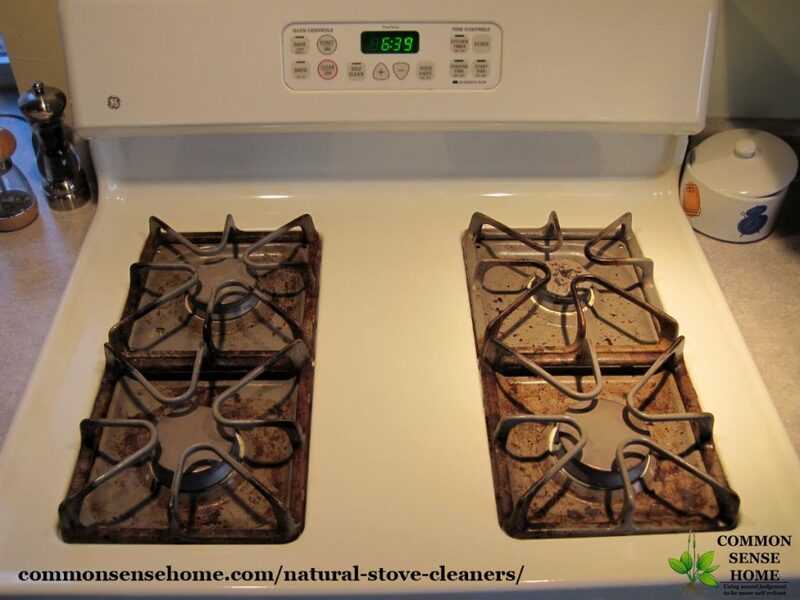 There are many different option for natural stove and oven cleaners. The simplest are straight baking soda, vinegar (or lemon juice) and dish detergent – no recipes needed. 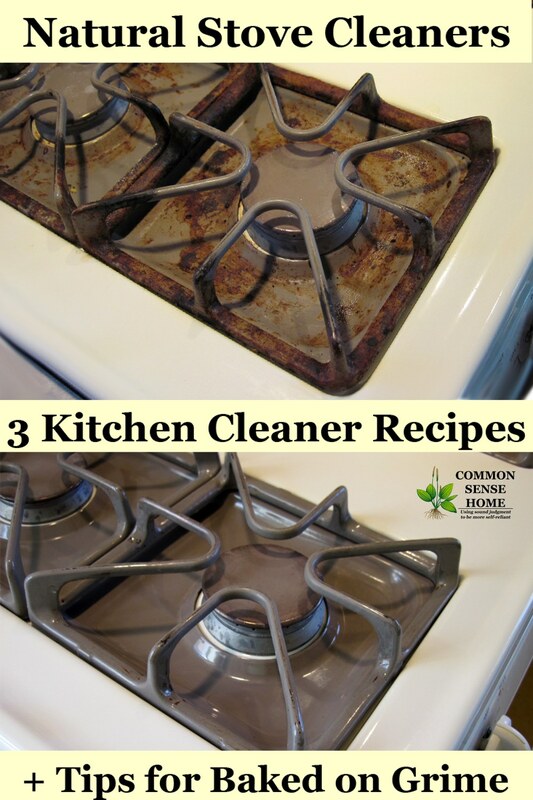 If you'd like a little more scrubbing power, try these easy homemade stove and kitchen cleaners. Place citrus peels (any type) in a glass jar (pack fairly tightly) and cover with white vinegar. Place lid on, and let steep for two weeks. Strain out peels. Mix infused vinegar with an equal amount of water and place in a spray bottle to use. To begin cleaning, carefully take apart the stove top. (Make sure it's cooled off first). Remove the drip trays and grates. On an electric stove with visible coil burners, you can carefully remove the drip pans and rings. Put drip trays and grates (or drip pans and rings), into a sink full of hot water and some dish soap. While the stove top parts are soaking, carefully clean behind any knobs by pulling the knobs straight out so you can get behind them. Don't twist or force! The knobs should pull off with gentle but firm pressure, and should only go on and off one way. 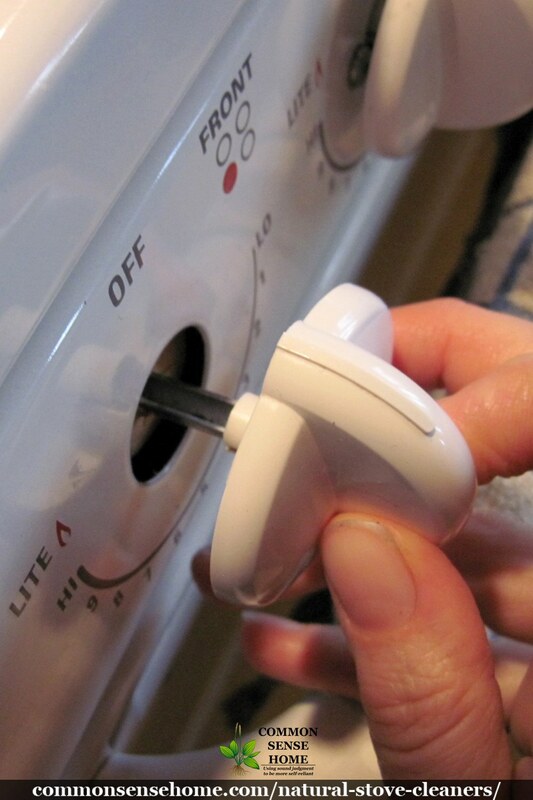 Be careful not to accidentally turn on the gas or burner while cleaning the knobs. Use a little dish soap or some of the cleansers if the area needs more TLC. Wipe down (or scrub) the stove top. Avoid getting cleaner on your igniters (gas stoves), or you may have to manually light your burners the first time you use them to burn the film off. Watch out for your heating coils and connections on electric stoves. After cleaning behind the knobs and stove top, go back to the drip trays and grates. If drip trays are grimy, coat with baking soda or other natural cleaner. Spray with citrus vinegar, and let the pans sit while working on the rest of stove top. Scrub with a copper scouring pad to remove cooked on grime. Chore Boy copper scrubbers are the sturdiest I've found. I prefer copper scrubbers to steel wool because they don't rust and are less irritating on my skin. Copper is also naturally resistant to bacteria. They're using in some hospitals now for door handles and faucets to help prevent disease transmission. Pretty cool, huh? Scraping away the worst of the cooked on food with a razor blade scraper or other handy blade will save a lot of time and effort scrubbing. I keep a couple of cheap dollar store paring knives around for just this sort of thing. They're lousy for cutting, but great for cleaning. The small knife allows me to get in all the tight angles of the grate where a blade scraper wouldn't fit. If you apply any of the cleaners and let them sit, or let the parts soak overnight, final scraping and cleaning should be much easier. Use the knife/scraper and the copper scrubber to remove the debris, adding additional baking soda or scrubbing powder as needed. Note: Do not use the copper scraper on a smooth top range. Stick with the scraper blade and a mild abrasive like the homemade soft scrub. Rinse well, and buff clean. Avoid leaving any cleaning residue on the sooth top range surface, as it may cause discoloration of the stove the next time it is heated. Old t-shirts and socks make very soft and absorbent cleaning cloths. And here we have one much cleaner stove top. Let me first say that I am grateful to have a stove vent that vents directly outside, as there have been a few times when foods have run over in the oven and smoke has been plentiful. It happens. The best way to keep your oven from sending smoke signals is to prevent the mess in the first place. If you bake, I highly recommend a pie drip pan. I don't put a pie in the oven without a drip pan and a pie crust shield. My pie drip pan has seen hard use, so the finish is coming off, but it still works just fine. 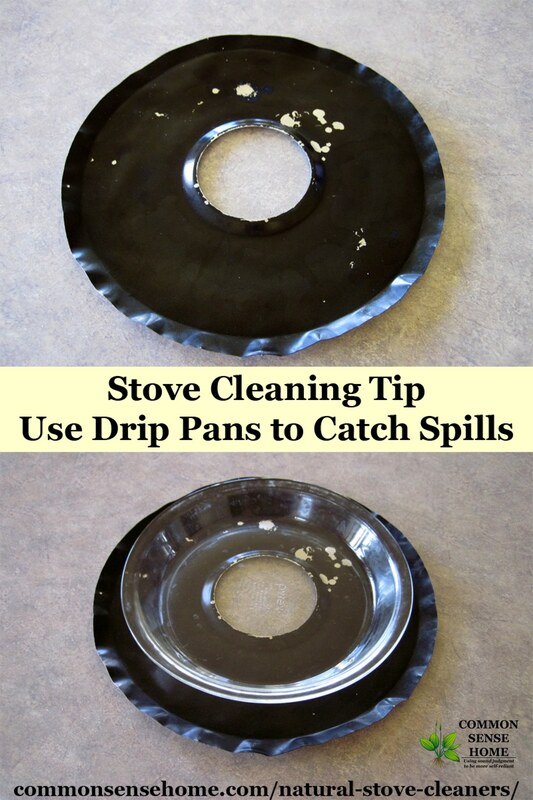 A pie drip pan is simple a round tray with a hole in the center to allow heat flow that is placed directly under a pie (or other baking dish) to catch spills before they mess up your entire oven. It's so much easier to use than foil, and can be reused again and again. Just let it soak in the sink, give a scrub, and you're good to go. Here's a shot of mine, with a pie plate placed on top on the right so you can see how it lines up. If you see (or smell) something running over, slide a piece of foil underneath it if possible, and pour some cheap table salt on the spill to soak it up and prevent excess smoking (or turn on the stove vent…). Wait until the oven cools, and scrape out the mess with a metal spatula. The salt treatment will make the goo lift off easier, in a lovely charcoal patty. Alternatively, if you're lazy, you can just let the mess sit and keep using the oven, and it'll get more broken down and ashlike over time. That said, it's going to stink and smoke, so I highly recommend taking the time to clean up instead. 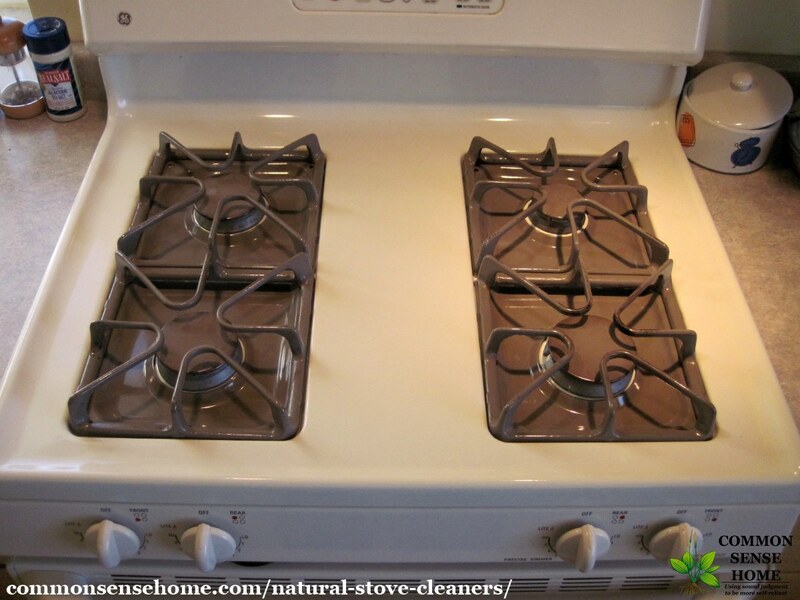 You can use the same methods recommended for the stove top. To soak, simply place a very wet rag over the problem area and let it sit for a bit. Most ovens now have a self-cleaning cycle to accelerate the “burn to ashes” step, but if you catch spills as they happen, you won't need it. I ran the self-clean cycle once for each of the ovens I've owned in the last 20 years. Don't line the bottom of your oven with foil! I know a lot of people do this, but it is not recommended by manufacturers. It may damage your oven and void your warranty. It may also contribute to uneven cooking, or create a risk of electric shock or fire. Don't spray any liquid cleaners on a hot oven, especially on the oven glass. Cold on hot can damage the surface finish, even break the glass. Just don't do it – be patient. You can wipe while warm, or sprinkle on dry powder, just don't spray cold on hot. Don't get too much vinegar or water on electric or gas connectors while cleaning. It's fine to soak the grates or metal drip pans, but don't soak your electrical connections or gas igniters with water or vinegar. Both liquids can corrode connections and damage your stove. Don't spray directly on electric connections or igniters. Instead, spray on your cleaning cloth and wipe around the area. Wipe off what you can as soon as you can, before it gets cooked on, and you'll save yourself time and effort later. Let the cleaners and soaking loosen stuck on grime before scrubbing. Use the proper tools to remove caked on food. Dealing with fingerprints and smudges on stainless steel? Most will buff off, but you can try Howard Natural Stainless Steel Cleaner for extra “oomph”. Want a citrus based degreaser without mixing it yourself? Try Biokleen Concentrated All Purpose Cleaner. Looking for an already mixed scrubbing cleanser? Better Life Kitchen and Bath Scrubber is well rated and ready to go. If you have any tips that you use that I've missed, please leave a comment. I'm always open to learning something new. Originally posted in 2012, updated in 2017. Wow, these are great. Cleaning the stove is by far my least favorite kitchen chore. Maybe this will make it easier. I cant remove the drip trays from my stove unfortunately and years of teenagers scrubbing and boiling over food have left mine in serious bad shape. I’ve not found a natural way to clean it yet.. for that matter, I havent found a toxic cleaner that would clean it though I have to say that “awesome” from Dollar Tree is slowly but surely working over time..
Just wondering what your reasoning was for using laundry sheets in the soak water? What does it do? It was something the ladies from church used to do when soaking pans with burnt on food. I’m not sure what’s in them, but it does seem to help a bit. Dryer sheets are very toxic. I wouldn’t use them in my laundry let alone anywhere near or on where I cook food! Amen, these dryer sheets are so toxic! I can’t believe people use them! Any tips for cleaning stuck on burnt on food on glass cooktops? I’d vote for soaking, maybe with the baking soda and oil mix so that the oils can work into and loosen the deposits. Apply and soak overnight, then try scraping with the blade scraper in the morning. just had my first glass top this year and figured out how to clean it naturally–this works like a charm! sprinkle baking soda over the top of the cooktop while it’s cool. cut a lemon in half and squeeze the juice from a half all over the top as well. use the lemon half (cut side down) to scrub everything into an awesome paste that will remove every single stain. wipe up and spritz with a homemade non-toxic cleaner (i use water/white vinegar/drop of soap/tea tree oil). repeat with other half of lemon if necessary. your glasstop will shine! Do you mean for the vinegar citrus cleaner? I just use equal parts water and vinegar, or maybe 1/3 vinegar and 2/3 water, depending on how strong it is. For instance, 1/3 cup vinegar to 2/3 cup water. just had my first glass top this year and figured out how to clean it naturally and quickly without scratching the top–this works like a dream! It’s easy.I have my own cleaning business,and run in to it so often.just get a scrapper.its very sharp. want scratch your stove top.after scrapping use glasstop cleaner and scrob with a paper towel.follow with a dry cloth.but don’t use a wet cloth.only a dry one and it’s polished and shiny like new. Some people use effective micro-organisms (EM) for cleaning their whole house naturally. This way reattaching of grease or dust or dirt gets way harder to occur. “effective micro-organisms (EM) for cleaning” – what is this please? “Effective microorganisms” are good bacteria that help break down dirt and grime naturally instead of with toxic chemicals. There are also types available that are used in the garden to enhance soil biodiversity, especially in soils that are worn out. Bicarb is wonderful for everyday stove top cleaning. I keep mine in a sprinkler jar. Just wipe (sometimes this is bit more of a scrub, but not much) with a microfibre cloth. It does a great job of the enamel without any scratching. You can buy a huge pack of microfibres at major hardware stores for under $20. Just toss them in the washing machine, bleach first if they are really dirty, and they can be re-used many times over. Great post! To make the citrus cleaner do you need to use fresh peels or can you used dried? I have about a half quart of dried lemon peels that I’d like to use up. I think fresh would work better, because some of the oils evaporate during drying, but you have nothing to lose if you want to use up the dried lemon peels anyway. I just cleaned under the knobs on my propane kitchen stove. I used rubbing alcohol (TURN OFF THE PILOT LIGHTS) and it worked like a charm! A good slop on a rag and a little elbow grease and it shined up like new. I soaked the knobs in rubbing alcohol and wiped them really well, too. BE SURE TO USE CLEAN WATER OR VINEGAR/WATER SOLUTION TO WIPE THE RUBBING ALCOHOL OFF AND DRY AS USUAL. I just cleaned our natural gas stove today. I used hot water, Palmolive, Comet and my drill with a copper wire wheel attached. It took time, but it did a fantastic job! What a good recipe, thank you for sharing! I like your picture before and after, they are very inspirational! 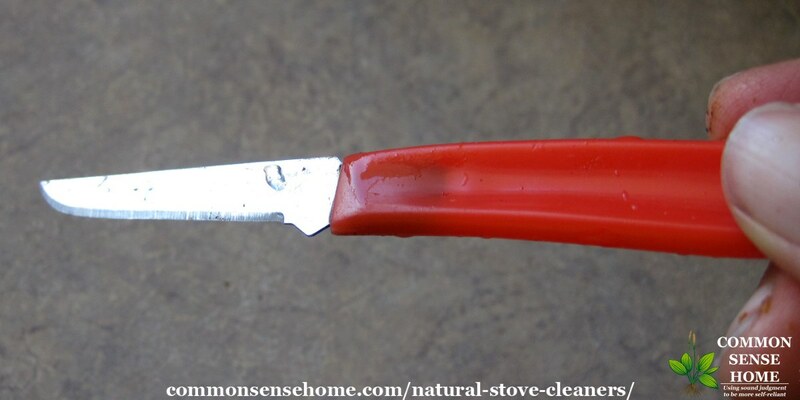 I clean my kitchen stove with baking soda and vinegar – I make a thick paste of it! Greets! Hi, I have a cook top that you can not remove the burner pans from. I am having a problem getting them clean have tried SOS pad and Dawn soap. Any suggestions? Lemon essential oil can remove scuff marks from floors. Another option may be Goo Gone Original Cleaner. How do I clean the burner (not stove grates) on a gas stove. The burners have removable discs (that pans sit on above the grates. I’m looking to clean the burners below the grates & discs on the actual stove that tend to accumulate dried food & grease. What are the recommendations that work? Those are some of the toughest spots to clean, for sure. Mine usually don’t get too bad, but I spot clean by scraping with the small knife and copper scrubbie. Salt, baking soda or other abrasive optional, but if you choose to use an abrasive, keep it away from the lighter area. OMG!! Thank you! I forgot to pick up oven cleaner during my store run, so I decided to look up natural ingredients. Lord knows I wasn’t in the mood for a burning throat and nose from the chemicals, but I was being lazy ? The baking soda and washing soap has my entire stove looking brand new!! Thank you again! ? So glad it worked well for you! Thank you for the good recipes! I don’t like using store bought detergents for cleaning at home and your recipes proved to be quite efficient. My stove top has never looked so clean, no matter what I’ve used for cleaning it. Thank you for sharing! I honestly love this baking soda and vinegar trick but I have a question! The other week I gave our little oven a good clean using baking soda and vinegar. Everytime we turned the oven on the electricity in the whole house cut off, almost as if the oven fried all the electricity. Our landlord replaced the mini oven and I was worrying it might have been because of the baking soda and vinegar. Today I cleaned the stove top using the same method due to it being really grimy – and now the SAME thing has just happened. There is not much information regarding this but I find it really odd that ive cleaned the stove top using even harsher chemicals but its only seemed to happen when ive used baking soda and vinegar. I suppose it’s possible that if you used an excess of baking soda and vinegar you might have damaged or shorted out something, but I’ve never heard of that happening from anyone else and not experienced it myself. If you’re shorting out your electricity in the whole house on a regular basis, please be careful. Different circuits should be isolated on their own breakers, and if they aren’t, your wiring may not be up to code and may pose a fire risk. Thanks for your help – yes i’ve never heard of it happening either. I’m actually only here temporarily while I’m working overseas and it’s an area above a house that seems like it used to be an attic but has been renovated to be a small studio type area. My housemate was really perplexed too when I let him know but I’ve read about 20 or so articles and not one has mentioned this being a possible error or something to avoid. Will have to let the landlord know tomorrow I suppose! I was talking to my brother about this, and he said if you used a lot of vinegar, it was likely that you shorted out the electrical connections (as I mentioned earlier). A little is good, more is not necessarily better. We just bought a new stove right before Thanksgiving last year, and the oven part is already looking sort of bad. The glass is not so clear as it was originally. We use liquid Castile soap on the stove top, but I … ahem … haven’t tried cleaning inside the oven at all yet. I think I’ll give your homemade soft scrub a try and see how it does. Thanks for the ideas! Really informative and great post, I’m researching natural cleaning ingredients and how to tackle tough cleaning jobs like cleaning the oven or stove etc. Haha you are definitely not the only one! My stove gets a quick daily clean but as you say, the grime really builds up over time! Washing soda is washing soda, also known as sodium carbonate (Na2CO3). It’s a water soluble salt of carbonic acid. You can usually find it in the cleaning section. The Arm and Hammer version of the product comes in a bright yellow box. Washing soda is a white powder.